60% of Dutch households have funeral insurance – the Dutch love insurance after all and this is one policy which is bound to pay out at some point. But no matter how much you pay for your funeral in advance, there are always stories in the papers about grieving relatives being fleeced by funeral insurers for extra cars and coffee and cake. Every year in the Netherlands a handful of people die alone, with no friends or family. In 2002, a poet known as F. Starik came up with the idea of the Poule des doods – a pool of poets who write and read a poem for the people who have no mourners at their funeral. Details of every funeral, plus poem, are on the website. Don’t read unless you want to weep. A funeral – service and cremation or burial – will cost you upwards of €5,000 depending on the extras. The dreaded coffee and cake for 50, for example, will add around €250 to the bill. 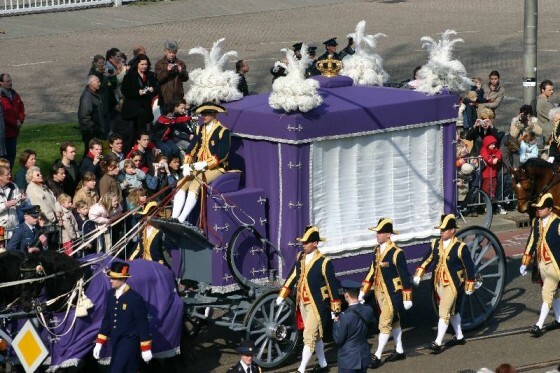 But there is a new trend in the Netherlands towards budget funerals with no ceremony at all – a bargain at €1,200. By the way, if you have pallbearers they may well be students. It is a popular student job. Research by the crematoria association in 2010 showed Dutch crematoria only collect an average of 50 grammes of gold and other precious metals per body, but they could collect up to 150 grammes. The money raised from selling the gold, jewellery and other recyclables is, they say, given to charity. Once you’ve been cremated, the funeral home will keep your ashes for a full month. This is in case they are needed for a criminal investigation – that is the official line anyway. After that, you can pick them up. But scatter them where ever you like? Oh no. This is the Netherlands, so there are strict rules about that. You need to ask permission from the landowner and that, if it is a local authority, can be rather expensive as well. Upwards of €1,000…. Still, getting buried in the Netherlands will cost you a whole lot more. The shortage of space means graveyards are scarce – so most people tend to ‘rent’ a grave for 10 or 20 years. After that, unless your family coughs up to keep you in place, your remains will be cleared out and placed in a mass grave. The most expensive council-run graveyard in the country is the Esserveld cemetery in Groningen, where a 30-year lease on a grave costs nearly €7,000, according to research by Dela. The cheapest council graveyard is in Littenseradiel, a group of hamlets in Friesland, where a 20-year plot costs just €456. According to funeral insurer Dela (yep, them again), the most popular song at Dutch funerals is Time to Say Goodbye by Andrea Bocelli & Sarah Brightman, followed by Eric Clapton’s Tears In Heaven and Marco Borsato’s Afscheid Nemen Bestaat Niet (there is no such thing as goodbye). In 2014, there were almost 140,000 deaths in the Netherlands. Cancer (led by lung cancer) accounted for 31% of all deaths, followed by cardiovascular diseases which caused 27%. There were an official 1,825 suicides in the Netherlands and 600 people died in traffic accidents, of whom 75% were male. 185 people died in bike accidents. Last year, 123 people were murdered. Seven in 10 victims and nine in 10 murderers are male. You are most likely to be murdered by a member of your family or a criminal associate – if you are a criminal that is. Don’t worry if you have not made a will. This being the Netherlands, there are very strict laws to cover wills and inheritances as well. That’s why there is a special breed of expensive lawyer, known as a notaris, to take care of it all. For example, you cannot disinherit a child no matter how much you would like to because they have a legal right to a percentage of your property and cash. You can, however, refuse to accept an inheritance, especially if you suspect it may be made up of debts (like unpaid funerals). And if you are adding up the cost of dying in the Netherlands, do remember this very useful Dutch saying: De een zijn dood is de ander zijn brood – one man’s death is another man’s money. Just about sums it all up really. After all, in een doodshemd zitten geen zakken, (there are no pockets in a shroud – you can’t take it with you). This list was first published by website Netherlands by Numbers.